Cute condiment or nut bowls, super light and pretty blue.can double as dessert bowl. Bells are back! Black and white! Simplicity and subtlety, Creamy whites. Blue pottery!! Some seconds for sale! Sale today and tomorrow! 25% off any purchase of $25. Use promo code 25LOVE in check out! Only two of these porcelain mugs left! Simple white vase, gift, decor, modern statement. Tea time! For those cold winter days! New soft cheese platter for pate. Beautiful glaze. Great gift for the chef in your life. 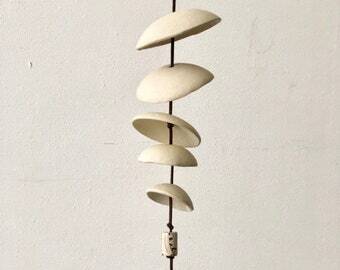 Wind chimes and bells! Ring in the new year! Funky pitcher to store coconut milk in your fridge- great gift! New large speckled white teapot- great gift! Black bells for black friday!! 20% Discounts on purchase over $100. Free shipping too! Sale this week! Shop now for big discounts! Thank you!! New white ceramic bells! Great hostess gift for the holidays! Thank you coupon for everyone! Reached over 900 sales on Etsy! Get 15% off for purchases over $100 Just in time for early holiday shopping. Enter promo code THANKYOU15 At check out. Modern look to these vases and cups. Love this glaze! Such a cute pair, great gift! 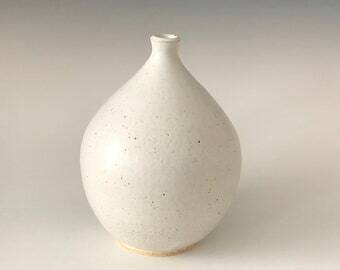 New fin vase in beautiful reduction fired shino glaze with peach blush and smokey gray colors. Fun little plates as gift! Ring dish. Cute pink cup with gold decal. Great toothbrush holder! Busy in the studio, more speckled pieces! Setting up to be bi-coastal! First kiln test fire. Maine and California! Today 25% off entire shop with minimum purchase of $25! Great wedding gift, or summer gift!